In the early 1600s London undertook an ambitious project to bring clean drinking water from the countryside into the heart of the metropolis. Central to this play were two ancient springs. Unlike their Victorian entrepreneurs who often emasculated their spring heads, those utilised in Sir Hugh Myddleton’s New River remain picturesque relics. He was given the responsibility in March 1609, with the provision that he completed it in four years. However, he encountered considerable problems with acquiring the land necessary, and many land owners believed that the scheme would result in their lands being flooded. Indeed, they even petitioned the government over the matter, but fortunately Parliament was dissolved and the matter was not discussed. Finally, in 1611, the Corporation of London extended the contract for another four years, but Myddleton sensibly approached James I for help. He agreed to take over half the costs and take half the revenue. This not only helped financially but landowners were impressed by the Royal patronage, and furthermore the King’s connection discouraged a rival scheme to use the River Lea at Hackney. On Michaelmas Day 1613, the scheme was completed, and a ceremony took place, not far from where Saddler’s Wells Theatre now stands, attended by The Lord Mayor, Myddleton’s brother, Thomas, and a great number of Alderman. With the accompaniment of rolling drums and ringing church bells, the sluice gates opened and water direct from Hertfordshire gushed into the Clerkenwell reservoir. The total cost at the end was £500,000 in those days an enormous amount. A joint stock company entitled ‘The Governor and Company of New River Brought from Chadwell and Amwell to London.’ The company enjoyed a Royal Charter, and Myddelton was appointed governor. However, it was not until after his death, in 1631, that any profit was made. Yet, in 1640s it saw great periods of prosperity, and remained a separate company for 300 years until it was absorbed by the Metropolitan Water Board. Myddleton in 1622, he was duly made a Baronet, and apart from those at Amwell, monuments at Islington Gardens, The Holborn Viaduct, and the courtyard of the Royal Exchange were erected to his enterprise. The name Amwell appeared after the 14th Century before then the well retained its original dedication of Emma. The name is believed to be derived from the wife of King Cnut or Canute. Confusingly, folklorist Gerish (1899) appears to suggest that the churchyard well was that regarded as ‘Holy’, being used in baptisms and being efficacious in cures. He does not give an exact location and I have been unable to locate another well. Easier locate is that commonly called St Chad’s Well (TL 350 135) is located between below the road between Ware and Hertford. It would appear that, rather than being associated with the Mercian missionary and patron saint of springs, its name is derived from O.E ceals for ‘cold’ spring, for in the middle ages, the site was called ‘chaldwelle’ or ‘caldewelle’. 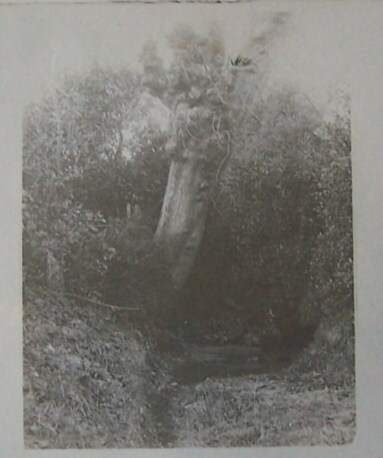 The name St. Chad’s well only appears from 1727. However, its water was said to be good for eyes. This belongs to New River Company 178 feet. 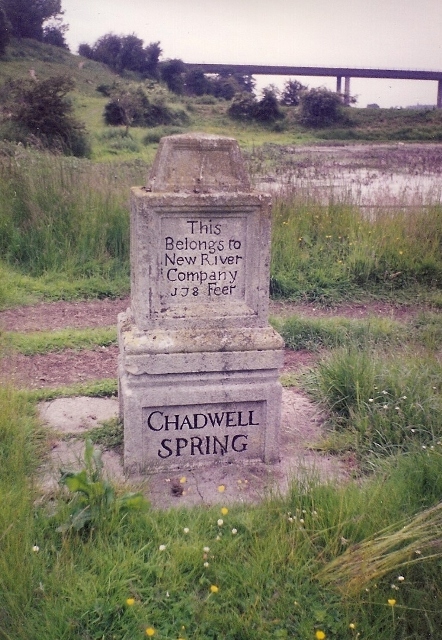 Chadwell Spring. The other side: This belongs to the New River Company 270 feet. Repaired 1728. The side panels reading, one side: 269 Feet. Opened 1608, and on the other: 43 Feet. Conveyed 40 Miles. This belongs to the New River Company. 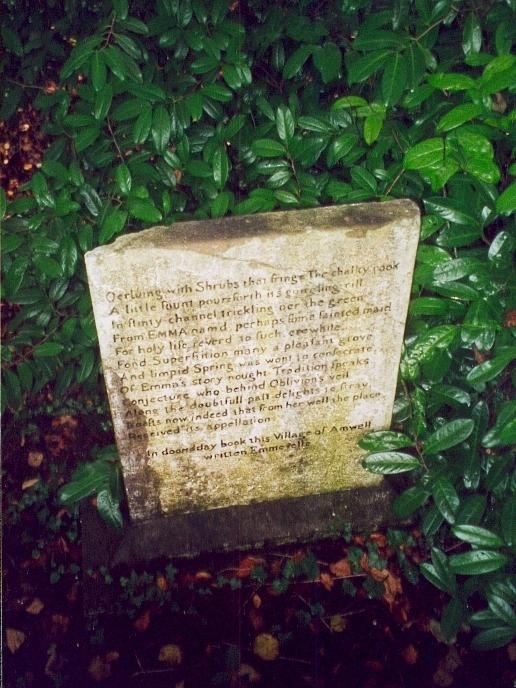 According to Hawkwood (1924) these monuments predate an older inscribed stone, which was found with the words ‘Chadwell’ on it in 1743. The presence whereabouts of this is not known. 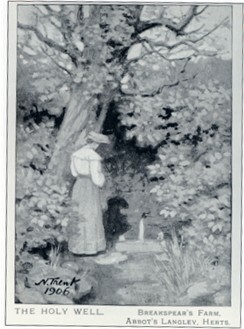 This is a common folklore motif, and is often connected to mysterious caves and legends of secret tunnels. However, it has also been connected to holy wells. 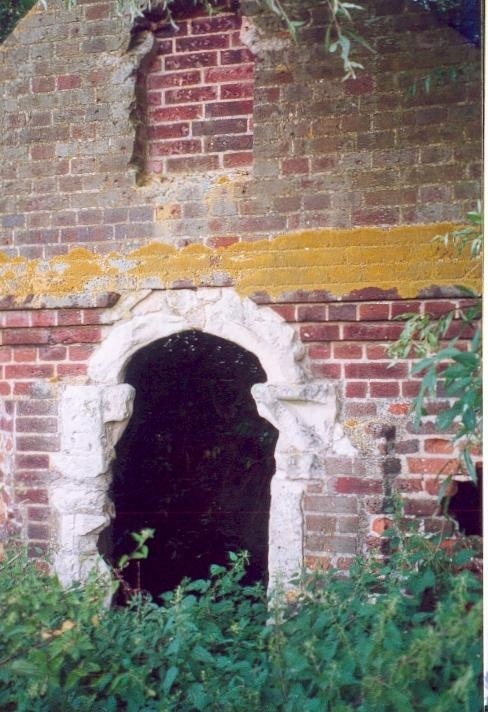 For example there is said to be a tunnel between Guildford Castle and St Mary’s Well, Farnham, both in Surrey. This was supposedly traversed by a goose, who also like the above tail appeared a little worse for wear the other end! 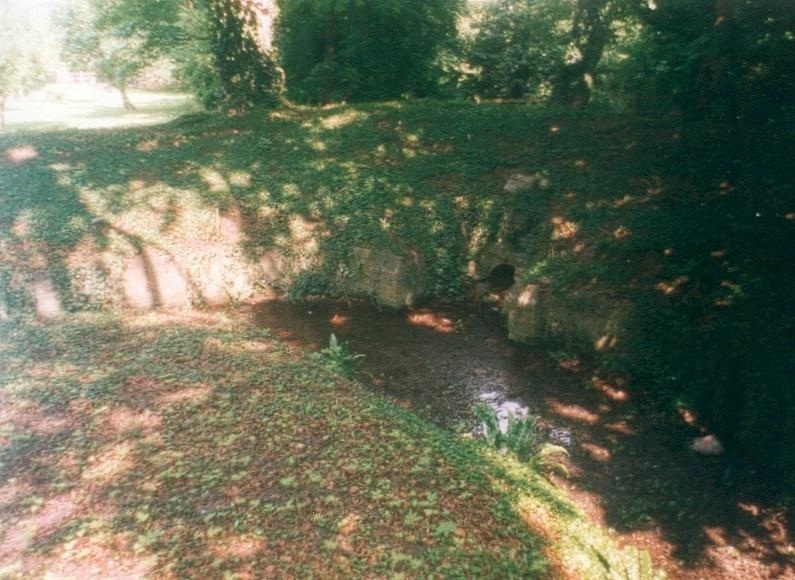 What is pleasing to note that unlike their Victorian counterparts, the scheme did not emasculate the spring and enclose it within an inaccessible chamber, they celebrated and romanticised their water supplies rather than santise and have left a romantic site for future generations to enjoy. “half a mile off; and there I drunk three glasses and went and walked, and came back and drunk two more. The woman would have had me drunk three more; but I could not, my belly being full -but this wrought me very well; and so we rode home… and my waters working at least seven or eight times upon the road, which pleased me well“. Yet, this did not deter him for on the 11th of August 1667 he returned, but this time he drank only three glasses. He put his earlier experience down to too much water! Another famed visitor, Celia Fiennes (whose visits to spas are well known) also complained. This time it was about the conditions at the well. She described it then as an enclosed building of lattice work, in which visitors descended steps to take the waters (so deep that one could not see the bottom). She disliked the means at which the water was drawn, being dirty, full of leaves and having to wait for the water to settle. In 1677, 20s was given; this was to be paid in perpetuity, by a Mr Owen, an Alderman of London, of the Fishmongers Company, for repairing of the well. By 1690s the dipper had gone and people were helping themselves, Daniel Defoe, in 1724 notes that it was ‘almost forgotten’.Indeed, the well was so popular that a clause had to be inserted in an Act of Parliament in George II‟s reign to secure access in perpetuity. The well was fashionable throughout the 18th Century and remained in good conditions until 1790. 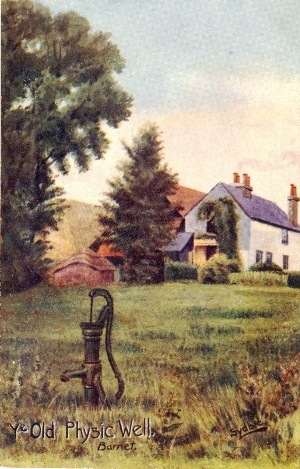 Subscription in 1808 was raised for arching over the well, and erecting a pump to aid any invalid who wished to drink. This was finally demolished in 1840, and a farmhouse erected near the site. Even in 1867, however, funding came from a local boy’s school for its repairs. Finally, in 1907 the water was declared unfit for drinking and consequently the well fell into obscurity. 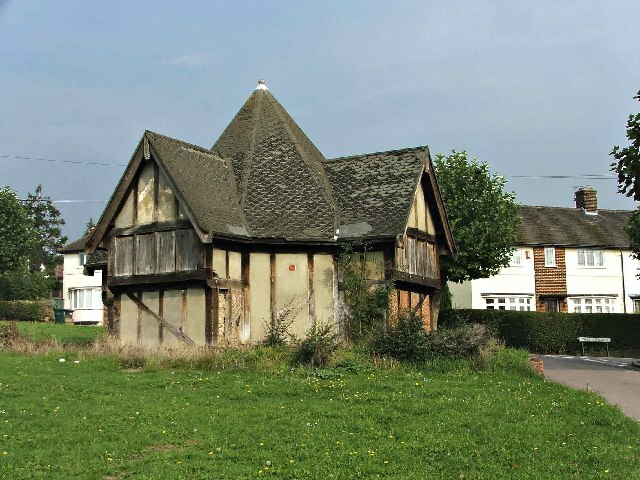 As the structure was in such a good condition, plans were made to preserve it, and a Neo-Tudor black and white well-house was built with a red-tiled pyramidal roof over it. This cost £500 and was completed by 1937. Unfortunately, by 1960 it was again in poor condition, and plans were made for its disposal. Fortunately, the hue and cry made by local conservationists saved it, and it was given a facelift. Today, it is surrounded by suburbia, being in the centre of a housing estate. Sadly, it is a little worse for vandalism, and one is unable to test the waters, as it is now padlocked. A peer through the door will show an octagonal well and its glimmering water source. The surrounding green is boggy underfoot, and one can only suggest that this is the spring arising around the area. This site is surely in need of greater protection and care and should be a candidate for Civic Trust openings. I don’t seeing it lasting long without some better protection. No book has comprehensively covered the topic in the county; which is surprising considering the fame of its most noted site St. Alban’s Well. The nature of this work, indeed all volumes, is thus to describe the sites under the respective parishes giving historical details and present conditions (with directions if the sites can be accessed). I have adopted Francis Jones’s (1954) category system for wells. The main body of the text covers Class A (saint’s names, those named after God, Trinity, Easter etc), B (associated with chapels and churches), C ( those with healing traditions which in this case includes spas and mineral springs) and some E (miscellaneous with folklore) sites The second part includes a list of named ancient wells with explanatory notes (mostly Class D i.e. those named after secular persons but possibly also holy wells and E). Hopefully once the volumes are completed and using similar documents for other counties this fuller picture will be achieved. 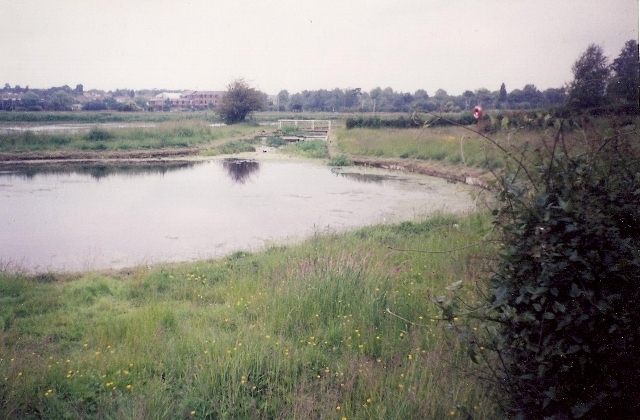 Some sites for example, often ponds are associated with the traditions of hidden treasure or hauntings. Treasure legends are common in the county. The only one in Hertfordshire is Rose’s Hole. This is not directly connected with a pool or well, but its description is virtually identical to other waterlore across the country and is worth noting. It states that the hole lay on Berkhampsted Common, named after an old man called Rose, who dreamt that there was treasure there. He and a companion went to the spot, where he was told it could only be reached by not speaking. They dug and soon encountered the lid, to which he exclaimed ‘Damn it Jack, here it is!’, and as soon as they did it sank back into the ground. 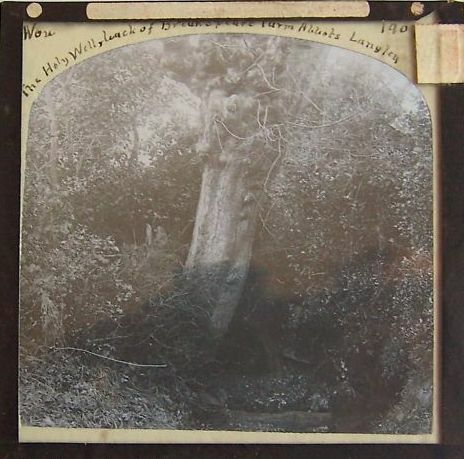 Similarly, there are other examples of water related ghosts, the only well-known one in the county is at Little Gaddeston. 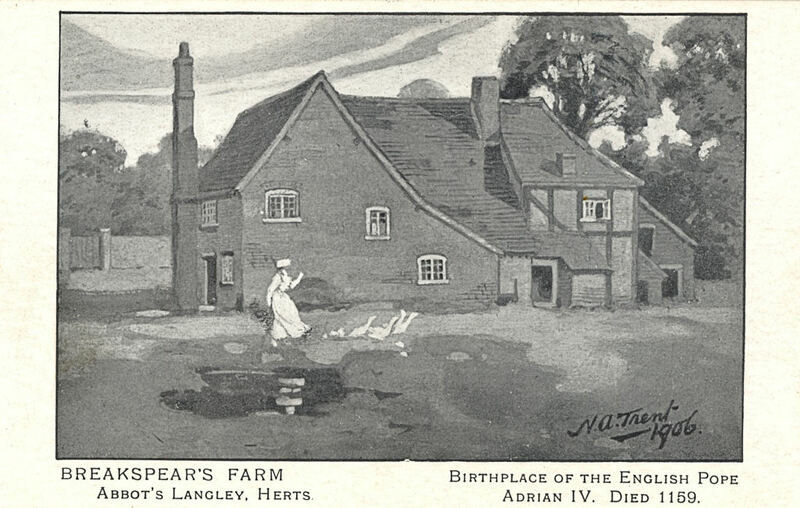 Here the village pond and manor is haunted by a suicide called Jennings, who killed himself after being unable to marry his sweetheart, the daughter of Lord Bridgewater of nearby Ashridge Park. The incident dates back to the 17th century, but may cover older traditions. Others are included in the gazetteer. These have been interpreted widely by some authorities as denoting some ‘religious’ activity. Traditions of treasure may derive from folk traditions of when the water body was regarded as sacred and that valuable offerings or votive gifts were placed in the water to appease the water deity. Similarly some have identified these water deities as the ancestors of water ‘ghost’ traditions, perhaps being the result of Christian missionaries, who personified them as ‘evil’. Two interesting geological phenomena are known to have attracted folklore across the country: swallow holes and intermittent springs and streams. Of the former, there appears to be a number. 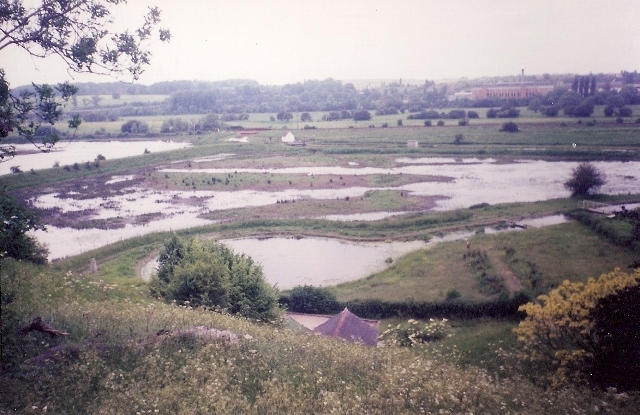 Examples can be traced at North Mymms, associated with the Colne. These are where the streams appear to flow back underground, the reverse of springs. This would certainly have appeared wondrous to our forefathers, however, I have been unable to locate any folklore. The former, were called Woe waters in Hertfordshire (and other counties), are discussed in more detail in the parishes in which they arise.